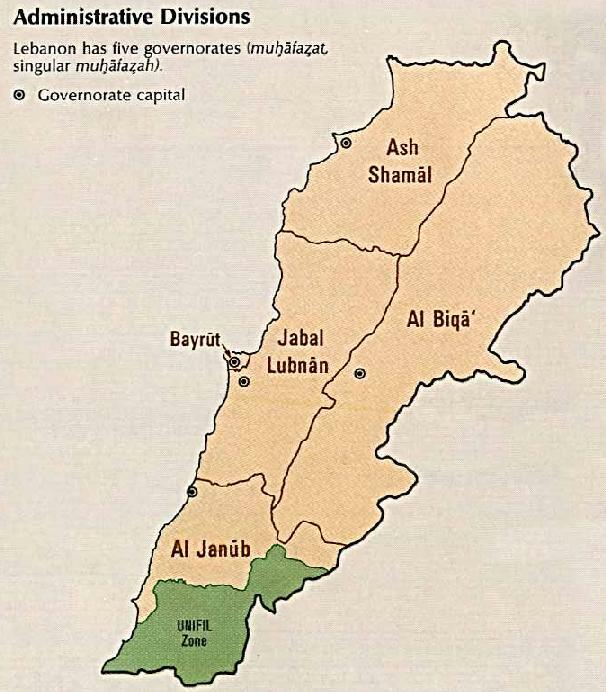 5 governorates (muhafazat, singular - muhafazah): Al Biqa, Al Janub, Ash Shamal, Beirut and Jabal Lubnan. 22 November 1943 (from League of Nations mandate under French administration). *Approximate dates: Moslem holidays follow the lunary Moslem calendar and take place some 10 to 11 days earlier each year on the Christian calendar. 23 May 1926, amended a number of times. Mixture of Ottoman law, canon law, Napoleonic code, and civil law; no judicial review of legislative acts; has not accepted compulsory ICJ jurisdiction. Cabinet: The Cabinet is chosen by the president in consultation with the members of the National Assembly. The current cabinet was formed 1995. (Arabic - Majlis Alnuwab, French - Assemblee Nationale) Lebanon's first legislative election in 20 years was held in the summer of 1992; the National Assembly is composed of 128 deputies, one-half Christian and one-half Muslim; its mandate expires in 1996. Four Courts of Cassation (three courts for civil and commercial cases and one court for criminal cases). Political party activity is organized along largely sectarian lines; numerous political groupings exist, consisting of individual political figures and followers motivated by religious, clan, and economic considerations. Three horizontal bands of red (top), white (double width), and red with a green and brown cedar tree centered in the white band. In addition to its indigenous political groupings, Lebanon contains branches of many other political parties of the Arab world. These cover the political spectrum from far left to far right, from totally secular to wholly religious and often are associated with a particular religion or geographic region. Palestinian refugees, numbering about 400,000 and predominantly Muslim, constitute an important and sensitive minority. Lebanese political parties are generally vehicles for powerful leaders whose followers are often of the same religious sect. The interplay for position and power among these leaders and groups produces a political tapestry of extraordinary complexity. In the past, this system worked to produce a viable democracy. Recent events, however, have upset the delicate Muslim-Christian balance and resulted in a tendency for Christians and Muslims to group themselves for safety into distinct zones. All factions have called for a reform of the political system. Some Christians favor political and administrative decentralization of the government, with separate Muslim and Christian sectors operating within the framework of a confederation. Muslims, for the most part, prefer a unified, central government with an enhanced share of power for themselves commensurate with their percentage of the population. The reforms of the Taif agreement moved in this latter direction.